Mike Fiechtner Photography || Seattle Wedding, Family and Senior Photographer — Oh the possibilities! First off welcome to my first post on my photo blog. I want to preface this first post with a note that this will probably be one of my longer posts and you will not have to read through a bunch of jib jab each time so please come back for future posts. They will be shorter, I promise! Well this is my first post to my blog strictly devoted to my hobby of photography. To give you a brief background on this hobby of mine, I used to have an old Sony DSC-P100 point and shoot camera and I loved messing around with the settings (mainly just shutter speed) to get different effects. I always loved showing people that all you have to do is slow down the shutter speed to get cool night shots. Thinking back on this I kind of laugh of the simplicity of this but it was very exciting to see their faces light up at the possibilities. Back then I was amazed too but didn't really know what else I could do until I set out on a journey to find my next camera and started reading about DSLRs. Another thing that got me interested in going to the next level was my good friend John Keatley. If you don't know John he is a professional photographer and produces some amazing photos that are printed in magazines and other mediums around the country. If you'd like to see his work check out his website: www.keatleyphoto.com. After months of research toward the end of 2008 I finally settled on one and got my first camera, a Canon XSi 450D for Christmas from my lovely wife Mandy. Since then I have been taking pictures non-stop and working at getting better quality pictures and stretching my abilities. I also didn't realize that I'd need to learn Photoshop if I wanted to get that extra "pop" to my photos. The purpose of this blog is to not only show you some of the photos I've been taking but also a chance to talk about my thoughts on my photography (excitements and frustrations), post processing that I've done and other posts just related to photography. I don't consider myself an expert but I will occasionally share some technical aspects of my photos and the processes I use. I will try to post the EXIF data (shutter speed, aperture, focal length) so you can see what I use for my photos. Feel free to ask any questions! I'll make sure to forward them on to a real photographer! Just kidding, if I can answer it, I will. If you want to look at more of the photos I've been taking feel free to check out my flickr site: www.flickr.com/photos/32585671@N05/. You will also be able to just click directly on any of photos I post in future posts. I plan on sharing more of the photos from my flickr site in future posts with thoughts on them. To start off with just a sample of the photos I've taken so far, here is a photo from my work trip to Ilwaco, WA. 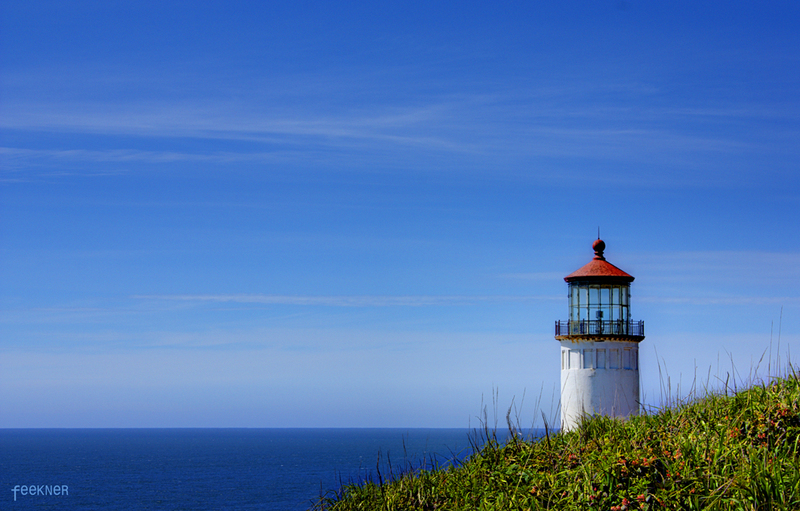 There are two lighthouses on Cape Disappointment but this was the only one I got real close to. I took quite a few pictures right up next to the lighthouse but this was from a little ways away and was one of my favorites. If you'd like to keep getting posts to this blog in your RSS feed please click the link to the right to Subcribe to Posts. Thanks for checking my blog out and I hope a few people find this enjoyable!